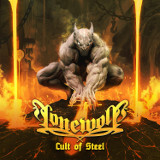 French heavy metal outfit Lonewolf's over-the-top image is one that puts off a lot of reviewers, many of whom dismiss the band as a cliched also-ran. All the leather and spikes, however, fail to conceal a tough, straightforward songwriting style, excellent musicianship, and a vocalist who perfectly captures this style of music. If you can't enjoy this sort of thing unironically, don't bother picking it up, but for most metalheads, their latest album, Cult of Steel, is overall a good find. The band's style comes with plenty of influence from the major German heavy/power metal bands of the 80s; vocalist Jens Börner's deep baritone is a lower-range version of Rolf Kasparek's throat-shredding vocals, and the The Cult of Steel's high-speed rhythm-guitar/bass line could easily be imagined as a Helloween song -- nifty melody and all. It and its more-mindless successor, Hordes of the Night, are fast songs and a hell of a lot of fun to listen to, which is more than I can say for Werewolf Rebellion, my least favorite. This mid-tempo filler's generic riffs and melody don't do it any favors, though Börner and lead guitarist Alex Hilbert come very close to saving it anyway -- the latter with a guitar solo that would be noticable even on a better song. Most songs do better than that; I especially liked Hell's Legacy, which had a verse that felt absolutely unstoppable, but Lonewolf can deliver the goods on slower songs like Funeral Pyre, too. Even though the beat's slow, the guitars merely play tremolo, as if on a black metal album, and the solo on this one, too, is very good, with chunky palm-mutes that one can sink teeth into. Most of Lonewolf's songs here, though, thrive on speed. The excellent Force to Fight is in this vein, and here the band seems to want to take Running Wild's formerly successful speed-picking songwriting formula, speed it up, and then occasionally add additional touches; NWOBHM galloping, tremolo picking, screeching harmonics...everything's welcome here, and likely to be welcomed by the listener, even when the songwriting gets a bit muddled. The album ends with The Grey Wolves, the fastest on the album, but one that would be a little dull if not for Börner's relentless enthusiasm. The man could probably make a Disney movie theme song sound headbangable if he wanted to, and the hit-and-miss songwriting gets propped up a lot by his uncanny ability in this regard, but it's a rather weak complaint to make about a band that some of their "OK" songs were made into good ones by their vocalist. Lonewolf hasn't changed its approach much from past albums; they're a fairly conservative band walking in the footsteps of past greats who perfected the technique. But what they do, they do well and enthusiastically, and Cult of Steel delivers that sound with a fist-pumping delight that even the most jaded, eye-rolling critic will find hard to resist.